This unusual name is of Anglo-Saxon origin, and is a locational surname from Lancashire and "Huncote" in Leicestershire. The placenames are recorded in the Domesday Book of 1086 as, respectively, "Hunnicot" and "Hunecote" and both share the same meaning and derivation which is "Huna's cottages", from the Olde English pre 7th Century personal name "Huna", a derivative of the Germanic word "Hun", meaning "bear cub", with "cot", in Middle English "cote", or "cott", a shelter or cottage. 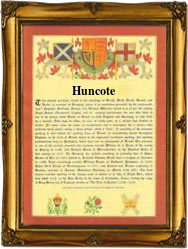 The modern surname can be found as Huncote, Hunnicot, Hunnicutt, Honeycote and Huncoot. Sarah Hunicut married George Stockall at St. Antholin's, Budge Row in London in December 1612. The first recorded spelling of the family name is shown to be that of Elena Huncoate, married Richard Thorpp, which was dated 11th November 1543, at Whalley, Lancashire, during the reign of King Henry V111, known as Bluff King Hal, 1509 - 1547. Surnames became necessary when governments introduced personal taxation. In England this was known as Poll Tax. Throughout the centuries, surnames in every country have continued to "develop" often leading to astonishing variants of the original spelling.